Last week when my nieces from Rhode Island were visiting, I asked the 9-year-old what she would like for dinner. "Do you have any macaroni and cheese?" she asked. "Sure, I'll make you some macaroni and cheese," I said, and began assembling the ingredients on the counter top, including pasta, milk, butter, and cheese. She looked confused. "Where's the box?" she asked. "The box that the macaroni and cheese comes in," she said. "I don't use the kind that comes in a box. I'm going to make you macaroni and cheese from scratch," I said. "Do you think it'll be better than the one in the box?" "Mmmm... I don't know. We'll see," she said. She watched intently as I began making the macaroni and cheese. When I poured the shells into the boiling water, she asked, "Where are the elbows?" "I'm using shells instead of elbows," I said. I was dealing with one shrewd mac n' cheese eater. She observed silently as I whisked the cheese sauce made with both sharp white Cheddar and Gruyere until slow, large bubbles rose to the surface, gurgled, then popped. When it was irresistibly thick and creamy, I poured it over the hot pasta and stirred vigorously. As it baked it the oven, the assertive aroma of Gruyere cheese permeated the kitchen. "That doesn't smell like macaroni and cheese," she said. "Uh-oh," I thought to myself. "I went too far. I shouldn't have used Gruyere." "But it still smells good," she added. "Whew," I thought, "that was a close one." As I removed the dish from the oven, she was impressed by its golden, bubbly, cheese topping. "Oooh, that looks good. It's all crunchy on top. The one in the box doesn't do that," she said. "Ha! I've got her now," I thought. Of course, what really mattered was the taste. I placed a big wedge of macaroni and cheese in front of her, anxiously awaited her evaluation. She took a mouthful. There was a slight hesitation as she held it in her mouth. Then she began chewing and smiling. She swallowed. Her eyes rolled upward, and she said breathlessly, "Auntie Susan, this is heaven." That's right, baby. Score one for Auntie Susan. 1. Preheat oven to 350 degrees. Coat a deep 2 1/2 quart baking dish with butter or cooking spray. 2. Cook pasta in salted water, about 2 minutes short of being fully cooked; it will finish cooking in the oven. Drain the cooked pasta, but do not rinse. Place in a large bowl. 3. Melt butter in a medium saucepan over medium heat. Whisk in flour. Slowly add milk, whisking continuously, until it reaches a boil. Reduce heat, and cook 3-5 minutes, stirring constantly. Add cheese and a generous amount of salt and pepper. Whisk until smooth; remove from heat. Add cooked pasta to the cheese sauce, and toss well. Pour into the prepared baking dish and top with remaining 1 cup cheese. Bake until the cheese bubbles around the edges and the top turns golden brown, about 35-40 minutes. What a nice aunt. Although her mom might be a little upset because her boxed macaroni will never compare to Auntie Susan. Gruyere is serious cheese :) She's got good taste! I encountered a similar situation, only it was with my husband ;) Great post! You are brave, trying to convert a youngster. Congratulations on a job well done! This is certainly the way I want to spend eternity! It looks heavenly indeed! Homemade mac & cheese are the best! That looks heaven-sent for sure. Oh how I love cheese. My nieces say that about my scratch mac-n-cheese too. They beg me to make it for them, and I tell you, I've never seen girls devour something like they tackle that dish. I think next time I make it that I'd better have gruyere on hand. That sounds perfect, along with a nice crunchy topping of seasoned and browned panko crumbs. I'm going to try this recipe. It looks delicious Susan. 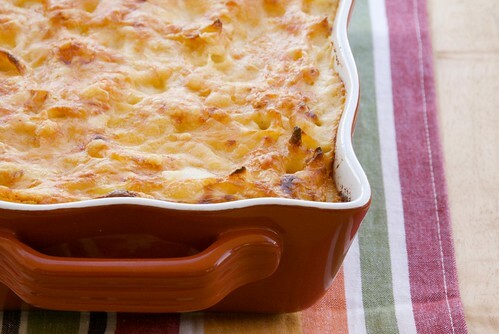 My son loves macaroni and cheese and I think he would like this recipe...I know I do!!! When we were kids, my brother's favorite food was Velveeta mac&cheese. One day, my aunt was babysitting us, and she decided to make my brother some homemade mac and cheese. She worked so hard on it, thinking that this meal would surely put her in the running for best aunt ever. When she presented the meal to my brother, he took one look at it and turned up his nose. He wouldn't even taste it, because the noodles weren't shell-shaped, and the cheese was the wrong color. No amount of begging could get him to take even one single solitary bite! My brother became a very adventurous eater over time, but my aunt still tells that story at family gatherings! "Where's the box?" Haha. Glad you made a convert out of her! I remember once my Mom cooked some homemade chocolate pudding. None of us three kids liked it and begged her to make it the "real" way... out of the box! What a great story and a great aunt also! Who could resist Gruyere? I bet she will be looking at that "box" with a new set of eyes now! Good post! Oh, kids... Hey, you can start a one-woman revolution to destroy the atrocity that is boxed mac and cheese. My little cousins love the stuff too. Mmm. Cheese powder. Hooray -- another victory for real food! Some day your niece will be making your recipe for mac and cheese, and whoever she's making it for will say, "ooooh, this tastes like heaven." Kids and that boxed macaroni! Blame it on the commercials on TV that do funny things to their minds. 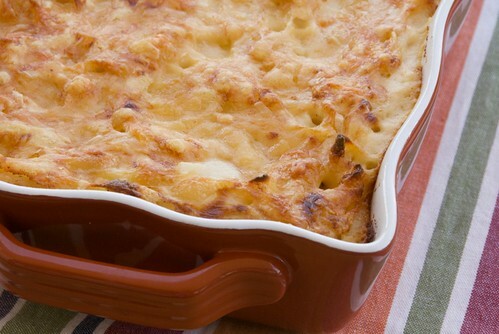 Your macaroni and cheese looks amazing! I'm so sad that your nieces have gone home. I love your stories! You are an awesome aunt. Way to open up their little macaroni and cheese world! I always swell with pride when I get compliments from both the adults and the kids at the table! I know I would certainly enjoy this. Love all that cheese! What a sweet Aunt you are. I'm so glad that story did end with her asking for Kraft after all. Nice work! What a great aunt! :) I love gruyere so I think it's fantastic that you've incorporated it here! What a wonderful story - you have rescued someone from the grips of fast food and introduced that little girl to a life of real food - made with ingredients and not flavourants and artificial colourants. Well done. As a Mac 'n cheese lover, you have my vote any time. I am so glad your niece has learnt the joys of cooking from scratch and the boxes aren't the source of all good food - and I am sure you have added some sophistication to her diet with the gruyere - she sounds like a sweetie pie! Way to go, Auntie Susan! I struggle with this obstacle from time to time with our kids - they're so used to the name-brand, out-of-a-box (or from a fast food restaurant) flavors, that sometimes it's hard to convince them that the more intricate, wholesome, real flavors of made-from-scratch dishes are superior! They're coming around though - my daughter was much more impressed with the orange chicken we made from scratch than what she's used to from Panda Express! And as for your mac and cheese? Sounds like heaven to me, too! it looks AMAZING! i had a similar experience with my daughter once long ago. i had a pirated luby's restaurant mac 'n cheese recipe, and she had previously only eaten blue box mac 'n cheese too. now she won't even eat that other stuff! Can this be frozen, and if so, do recommend freezing it before or after cooking? I LOVE this post! you so totally rock the cool aunt stuff. Loved this story! I am thinking REAL mac and cheese is going to have to feature in my kids' cooking club next term. We need to make kids realise how easy it is to make stuff that is SO MUCH BETTER! Love the breathless quality of this post ... and the mac & cheese Auntie Susan. maria-It is a pretty awesome job! catherine-I think she'll love it too! dandy-It's so easy to love. kate-I love toasted breadcrumbs on top too. debbie-Hope you both enjoy it! pam-I think she will, indeed. anh-This might just do it! mark-Cheese powder is tough to beat with the little ones! lydia-Oh, that's such a lovely image. beth-It really is so much better. tastyeatsathome-It's a process, but I do believe if we as adults keep offering our kids real food, they'll develop a taste for it over the processed stuff. rora-You so just made my day! a-I haven't actually frozen it. But I would suggest freezing the whole dish uncooked. Or freezing already cooked mac n cheese in individual portions.Let me know if you do it and how it works! mardi-Kids cooking club? That sounds fun! jenni-Then this recipe came just in time! Susan - actually BETTER than that, it's a BOYS' cooking club! (I work at an all boys' school) for 9-11 year olds. LOVE IT! mardi-That must be wonderful! I can see why you love it. kristy-I sure hope you do! I made this tonight and it was AMAZING! I couldn't find gruyere and substituted regular Swiss. We absolutely LOVED it! Thanks! Okay, so apparently I was having a brain malfunction in the cheese section of the grocery store. I knew that for 2 cups of cheese, I would need 8 oz, but for some reason a half-pound was just not adding up to 8 oz in my head. Anyway, I made this for dinner tonight with smoked Gruyere and extra sharp non-white Cheddar cheese. I used whole-wheat flour because that's what I had. It's really yummy! You weren't kidding, though, about needing a deep casserole dish! I thought 4 1/2 cups was going to be WAY too much milk, and then I thought it would never set up. But it did, and it was worth it! Umm, this sounds so delicious. I'm going to have to try this. I haven't been able to convery hubby to homemade mac and cheese yet, but I keep trying. Maybe this one will do the trick and we won't have to keep getting the nasty velveeta box stuff. I need to try this one! I would really prefer a "from scratch" version that my boys would eat... and this has serious potential since I know it was a hit w/your niece! I never knew till recently that mac 'n cheese came in boxes. I think I'll agree with your niece's sentiments looking at yours, though.